We have first quarter 2013 GDP data for about 53% of the OECD countries list. There are a number of interesting observations we can make this month. The first is that whilst the percentage of economies experiencing a single quarter's negative growth seems to have subsided from a meteorite rise, the percentage of economies experiencing two consecutive negative quarters seems to be marching resolutely upwards in a worrying trend. At this stage, with only 53% of the data in, we need to wait for more quarterly GDP figures to come in during the course of the next weeks before being able to draw any concrete conclusions from this. 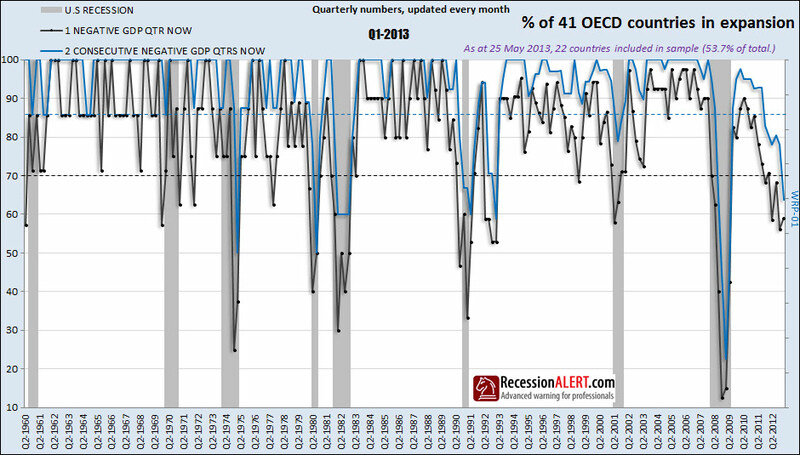 Looking at the below chart, it is clear to all but the blind that the world fell into recession according to the classic “two consecutive negative quarters” definition around 1st or 2nd quarter 2012. When looking at the recovery from the 2008 Great Recession, it is notable that neither the black nor the blue line in the above chart managed to recover to levels which they normally did in the past. 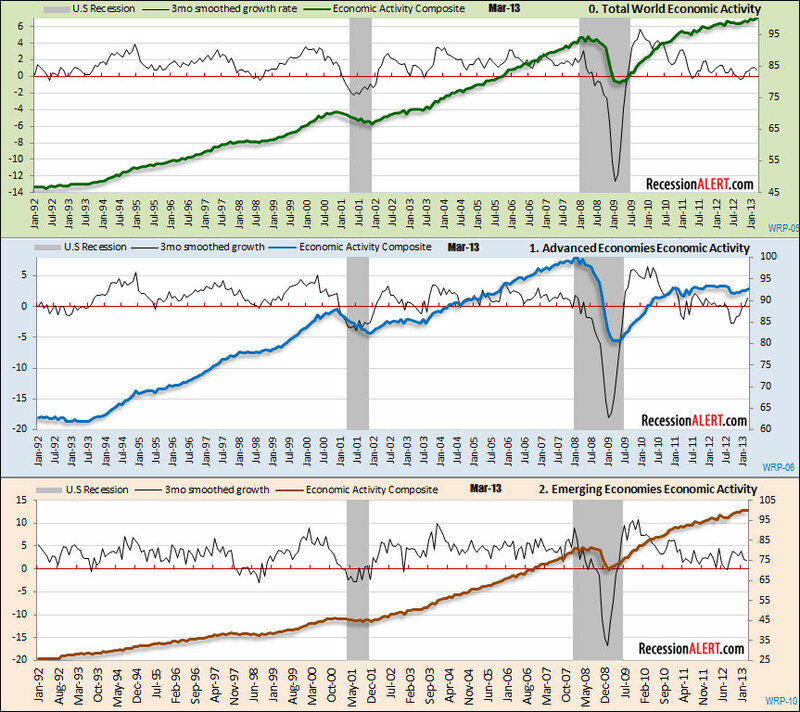 After the normal post recession 4 quarter meteoric rise, both lines “stalled out” and resumed their downward trajectories. This is entirely consistent with the recovery behaviour we demonstrated with our “Atypical Global Recovery” REFLECTIONS posting 2 weeks back. Quarterly GDP data is really a very lumpy, lagging indicator subject to large revisions and to obtain more timely, less revised and better granular monthly views on co-incident world economic activity, we should look to the World Composite Economic Activity Indices we developed and track in the detailed monthly World Economic Report for subscribers. If you recall, we inspect aggregate world trade volumes (imports and exports) as well as world industrial production output figures to form a broad-based composite of current world economic activity of about 83 countries in total making up 97% of all world trade. This is showing a world economy that briefly visited recession territory but now seems on the mend again. It is clear the advanced economies were firmly in another recession following the 2008 Great Recession whilst the emerging economies managed to skirt recession. To read the full report on RecessionAlert, click here.